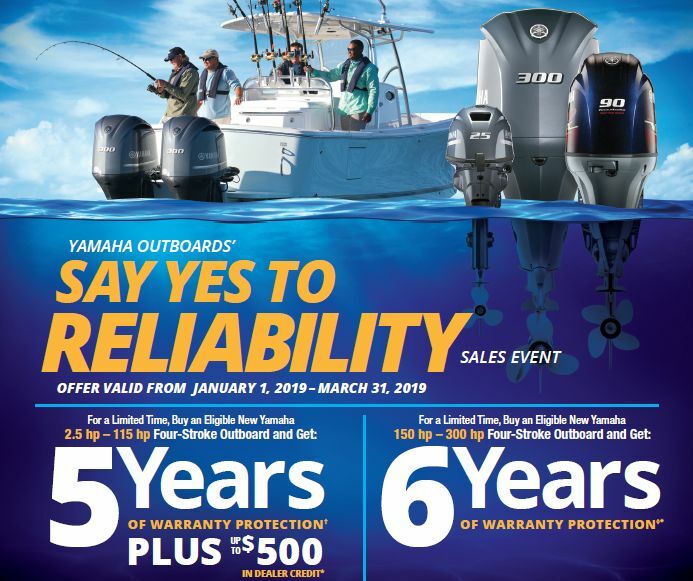 Valid now through March 31, 2019, don’t miss out on extended warranty protection during Yamaha’s Say Yes To Reliability Sales Event! Yamaha outboards are the true choice for reliability on your new outboard-powered Robalo or Chaparral. All models up to 115 HP receive a total of Five Years of Warranty Protection* and a Dealer Credit worth up to $500. Models 150 HP and above receive a total of Six Years of Warranty Protection* during this promotional event. *Of course, see your Pier 33 Robalo or Chaparral Specialist for full details, but DON’T WAIT – take advantage of this special program through March 31, only!